Five of the carnival glass patterns illustrated in this segment are seen as part of the “Etruscan” assortment in Butler Wholesale Catalogs. 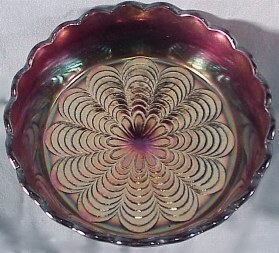 PEACOCK TAIL: Placed as an interior design for the stemmed bowls in the Maple Leaf berry set. These sets are found in marigold, amethyst, cobalt blue, and very rarely-green. 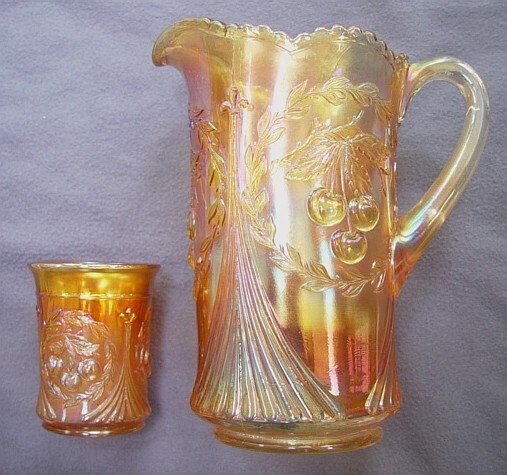 MAPLE LEAF: Carnival Glass versions of this pattern came from molds left behind by Northwood, and first appeared in 1910. After 1913, Diamond continued limited production of the pattern until 1928. 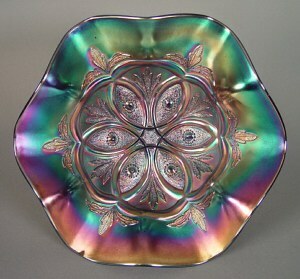 Iridized versions of the pattern were limited to water sets, berry sets, and table sets. Variety of colors is limited. Body of the bowl in the berry set is unusual, supported by three twig-like stems which form the leaves on the pedestal foot. Somewhat available today in marigold, more scarce in amethyst/oxblood. The same situation exists with the table sets. Many of the oxblood-dark amethyst examples are found with the familiar gunmetal or silvery iridescent finish. Only one small stemmed bowl is known in green. No other green examples have been found. Green is not a color associated with much Dugan production. When matching tumblers to complete a water set, please bear in mind that two versions exist. One has a wavy line separating the leaf from the band of scalloped panels at the top. The other version has a straight line. The version having the wavy line seems to be more readily found. Caution: L.G. Wright marketed new water sets in amethyst, cobalt blue, and ice green. There are also new table sets in amethyst and cobalt blue. Some pieces are marked with “M” in the base, indicating that Mosser has reproduced some examples. WREATHED CHERRY: Some of these pieces are marked with the D-in-a-diamond trademark. The berry set is oval shape, leading to the large bowl being referred to as a “banana boat”. Berry sets are known in marigold, amethyst, white, peach opal, cobalt blue, and oxblood. The berry set only is found in peach opal. Other shapes do not offer this option. Table sets and water sets are to be found in marigold, amethyst, oxblood, and white, with marigold being most available. A table set or water set in any color is really a rare find. An amethyst toothpick holder can be found in (old) glass. Many of the white Wreathed Cherry pieces are found with a fired-on gold and red decoration on the cherries and leaves. 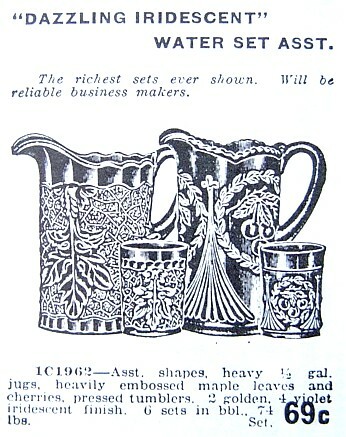 At least one marigold water set is known to have this ornamentation, as well. 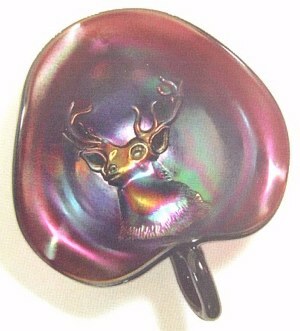 ELK NAPPY: A flurry of commemorative pieces were manufactured between 1910 and 1914 by Fenton and Millersburg. They were made for specific conventions of the Fraternal Order of Elks, having dates and names of cities involved. Don Moore credited its production to Fenton. An early Edwards book attributes it to Millersburg. The photo of the Nappy having ruffled edge was shown to William Heacock in Canada by collector Ola Shoom. It appeared to be an uncredited piece of Dugan, but he needed to see a good picture of the base to be certain. Mrs. Shoom generously responded, providing a clear photo of the base, making it appear certain that the piece is of Dugan origin. It was made with a special plunger in the mold for a nappy originally produced around 1906 in opalescent glass. These nappies are identical in size (approx. 5” in diam., depending upon the flare of the crimp) and have identical bases and handles. No date or city is pressed into the piece, as is found in the other known Elks convention souvenirs, so this nappy may not have been produced especially for that particular lodge group. Known only in amethyst, with only four of them confirmed to date, three of them being spade-shaped and the other more rounded with a ruffled edge treatment. A slight mystery surrounding this piece might be explained this way. Some years ago, a Fenton bell surfaced, having the name Portland in the mold. It is the only such bell, so marked. It has been theorized that it is a sample or test piece, which never went into production. Perhaps this nappy falls into the same category. Possibly the intended convention never took place, or perhaps various producers were requested to submit sample ware for scrutiny by a committee who did not decide to place an order. 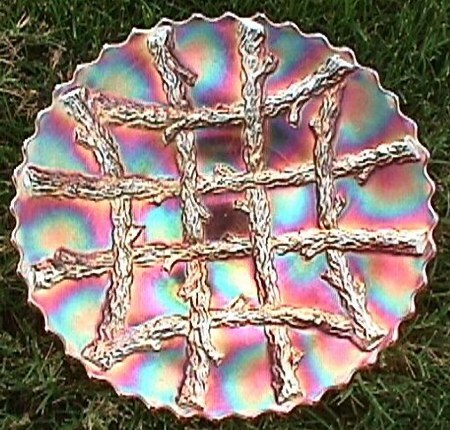 GRAPEVINE LATTICE 7” PLATE: Perhaps many of you know that L.G. Wright reproduced water sets, small bowls and plates in purple carnival. What you may not know, is that as long as twelve years ago (1992), we stopped at a place called The Red Barn in New Martinsville, WV. A man and his son were proprietors of the fully stocked store. 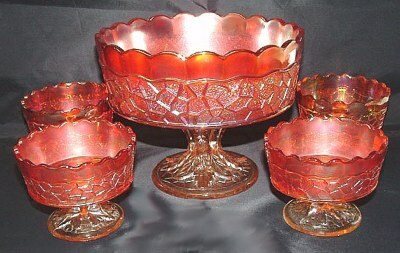 The elder gentleman had worked for Fenton and other glass manufacturers in the Ohio Valley, had obtained the molds for Grapevine Lattice 6'-7” bowls/plates. There was a furnace in the back, a lehr, and all that was required to produce these amethyst plates in such quantity that there were two stacks of them with heavy paper in between, possibly two dozen of them, very nicely iridized to appear OLD, and they were unmarked! Beware! Glassworkers are much like carpenters. They work wherever a living wage is provided and the tools of the trade are at hand! LATTICE & POINTS: Vases of 8”-9” in marigold, amethyst, white, peach opalescent, lavender, cobalt, pastel marigold (some having the Daisy on the inside bottom), along with plates, 7”-8” in white, 6'-7” bowl in marigold, amethyst, white, pastel marigold, and a hat shape in marigold, amethyst, white, peach opal and pastel marigold are found in this pattern. None of the above are easily found. Blue vases are far and away the most difficult to find. VICTORIAN: Most examples of this 10-12” impressive bowl are ruffled. One round, low ice-cream shaped bowl is confirmed in amethyst color. Typical of the bold, stylized designs which emanate from Dugan manufacture, this one is unique to this bowl. Most collectors have an impulse to own one of these shortly after becoming collectors. It is spectacular enjoyment for pattern collectors who are always looking for a “different design”. 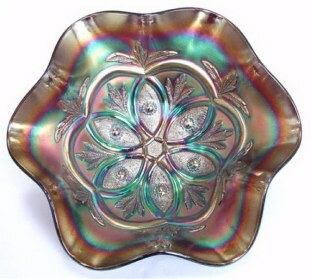 Peach opalescent bowls are not easily found, but are quite pretty. The exterior of these bowls is smooth and non-iridized. 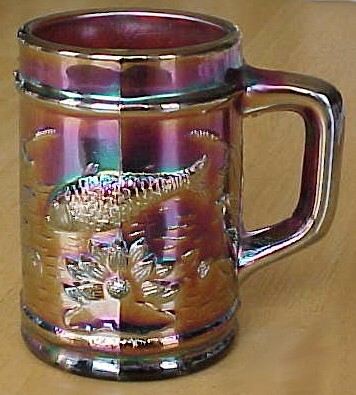 FISHERMAN'S MUG: First appeared in 1911 and production continued at least through 1914, spanning both the Dugan and Diamond eras. Amethyst is the most often found color, with marigold and cobalt blue examples following in order of availability. The peach opalescent is the rarity here. Few are known and they sell very well, when making an appearance. SWAN: The Dugan Swan differs from the Fenton version in that the neck emerges from the body near the base, leaving a large portion of the body above the neck open. Marigold is seen more often than amethyst. The Fenton Swan has an emerging neck which covers nearly the entire front portion of the body. The colors are in the iridized pastel shades of celeste, ice green, ice blue and pink. Another difference we have noticed: Some swans have a feather design on the neck area, rather than the stippled dots found on the Dugan Swans. Some say these are newer types, others feel that the presence of feathers indicates a different manufacturer. You can decide that issue for yourself. 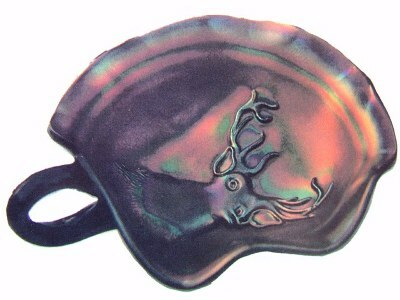 Note: Fenton acquired the Swan mould from Northwood in 1926 and produced the iridized colors noted above. 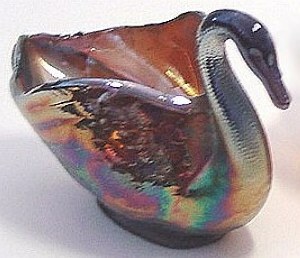 Imperial and Fenton reproduced iridized swans in the 70's and 80's. Not all are marked. When Imperial closed in the early 1980's, their swan mould was purchased by Indiana Glass. 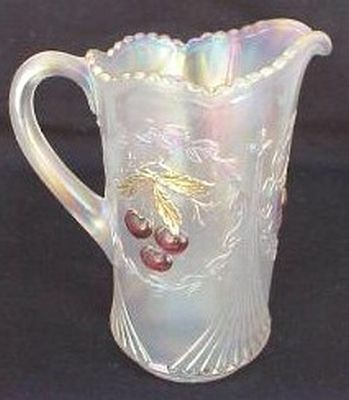 Indiana Glass reproduced non-iridized swans for Tiara. The Indiana Glass/Tiara swans are not marked.